The virtual archives have been rapidly expanding. Today expands the MUSCLEMANIA virtual archive. This expansion is provided by RetroToyReview. They send a lovely note about purchasing a MUSCLEMANIA 4-pack, being appreciate for finding information about the line, and wanting to submit their 4-pack. The days of documenting and hailing individual 4-packs has ended. However, documenting the various individual MUSCLEMANIA figures is still underway. Three of the figures in this 4-pack have been previously documented. The fourth figure, a Green #14, is a brand new discovery. The University of M.U.S.C.L.E. 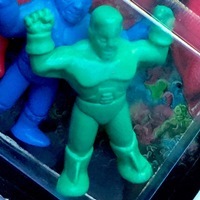 is always looking to document M.U.S.C.L.E. information. If you have any pictures to add to the visual archives, please don’t hesitate to email your pictures to the University of M.U.S.C.L.E.. This entry was posted on Monday, September 21st, 2015 and is filed under Anthropology, UofM News. You can follow any responses to this entry through RSS 2.0. You can skip to the end and leave a response. Pinging is currently not allowed.